A very close friend of mine was relocating from the States to the UK this year and as a going away gift I wanted to give him something special! I spent hours scouring photo albums from our trips until I found a photo that inspired me. This image was from a trip to Prague in 2011. We were sitting in the courtyard of one of the many art museums in the city looking through a guidebook. The image seemed fitting considering all the trips that we have traveled together. I drew this self portrait when I needed some pieces to update my portfolio years ago for entrance into graduate school – Art Education. Immediately after graduating college in 2003 I fell into a creative funk. I no longer had steady access to a printshop, wasn’t even sure if I wanted to continue with printmaking, and was suffering from a creative block. I don’t recall creating anything artful for about three years until I decided that I needed a change and thought that returning to school for my masters in Art Education would be the change I needed. In a way it was. It brought the act of creating art back into my life. I left school knowing that I wanted to make art. This self portrait was drawn from a photograph taken of myself by a close friend at one of our social gatherings. We often got together all dressed up in thrift shop finds and dance all night in my friend’s living room. I remember this carefree night clearly and I remember this dress. If I recall, the neighbors hated us! This is one of my favorite drawings and I have often had offers by those close to me for it, but I could never part with it. The piece has meant so much to me. A portrait of myself from one of my happiest memories, my reemergence as an active artist and was one of the first pieces I created after college that I felt proud of. The photograph of the drawing is not the best. 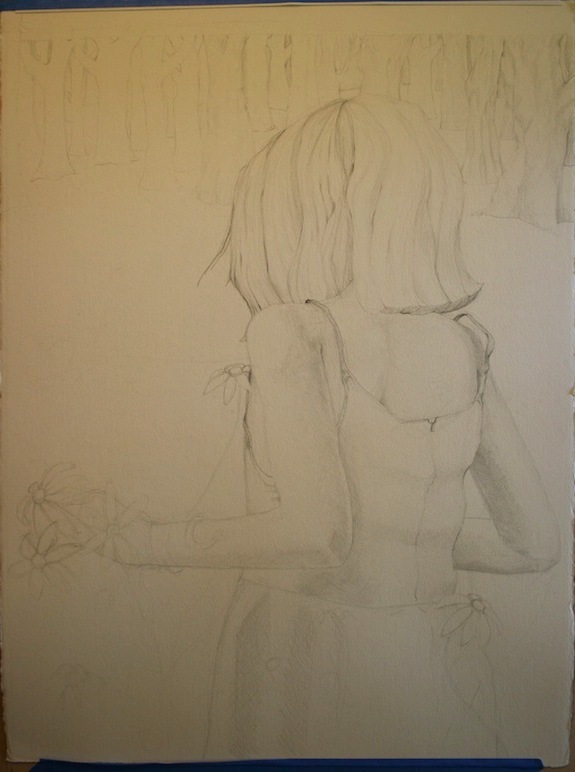 There is a light tea staining in the background allowing the details of the graphite to push forward.